Lübeck is a little gem in the North of Germany. The city used to be part of the Hanseatic League and was a rich merchant city in the Middle Ages. Its medieval old town is located on an island in the middle of the river Trave. A well protected, strategical position which provided the citizens of Lübeck with incredible wealth. Even today the former prosperity can be sensed in the many beautifully restored buildings of the city, in the merchant houses, the churches and hospitals, the alleyways and medieval social housing projects. Views over the roofs of Lübeck from the spire of St. Peter’s. You can easily make out St. Mary’s, the market square and the town hall. When I was still at university I once read a book by one of Germany’s best known authors, Thomas Mann. The book was called “Buddenbrooks”. I read it not because it was required reading for my studies but because I wanted to learn more about the rise and fall of the Lübeck merchant family Buddenbrook. 20 years later my memories of the story had faded, so I felt compelled to re-read the novel to refresh my memory. It was indeed an entertaining tragedy, one that was loosely based on the author’s own family history. I would lie if I would claim that reading this book again did not have influence in regards to picking a destination for the autumn school holidays. I knew that I had to visit Lübeck sooner rather than later to see not just the famous Buddenbrook House but also the Holstentor Gate, one of Germany’s great monuments, and the picturesque old town of the old trading city. This post is about everything that we did and saw on our day trip to Lübeck. Needless to say, we had a blast and were able to discover some real treasures and beautiful sights of which we didn’t even know they existed. Would I recommend a trip to Lübeck while you are staying in Hamburg or on the Baltic Sea or travelling through from Denmark? Absolutely! The Holstentor Gate is Lübeck’s best known landmark. What many don’t know is that it is just one of several city gates of the same name, however, this is the only one that survived. We conveniently started our day trip to Lübeck with a visit to one of the city’s most remarkable landmarks, the Holstentor Gate. An impressive and quite imposing structure. It had undergone some cosmetic changes over the centuries and today looked much more romantic than it probably ever did in the Middle Ages when its main purpose was to defend the city from raiders. So we started our city tour by passing through the city gate, which today housed the City’s History Museum. It was only when we got very close that we got a good look of the building and could see how wonky and crooked it actually looked. I think the picture above shows it clearly, this was not something that the camera lens had added. We studied the many details of the Holstentor for a while and then it was time to inspect the next Lübeck attraction. The riverside salt storehouses were once used for the trade of salt between the city of Lüneburg and the countries of Scandinavia. From the other side of the Trave river one could easily see the beautiful red brick buildings that were once used as salt storhouses. Built in the late 16th to the middle of the 18th centuries they were technically speaking not medieval but still, we couldn’t help but notice how fantastically crooked they were as well. The way their image was mirrored on the surface of the river on this fine autumn day was just magical. In former times, the storehouses would store salt produced in the salines of Lüneburg and Oldesloe to be shipped to Scandinavia. Today, it was home to a fashion department store. We continued on to the centre of the medial city, but not without a quick stop at the Mazipan Speicher, a marzipan specialist shop where we were treated to some of the first Christmas treats for this year. 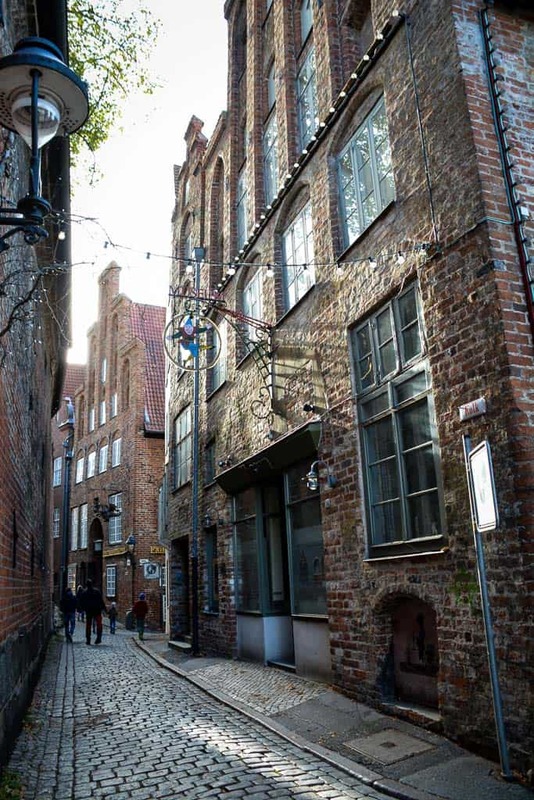 The narrow lanes near the doll theatre give you a slight idea of what life was like in the city of Lübeck in the Middle Ages. Since the road leading away from Hostentor Gate and straight into the heart of the city looked not very promising, too many cars, ugly post-war buildings, we took a turn and followed some narrow lanes into the maze of the old town. Here, the Middle Ages were still truly alive, a confusing maze of cobblestone streets and tall brick buildings. We walked past the pretty Figurentheater, a traditional doll theatre which looked very promising. Here, the sidewalks were flat to allow cars to pass the narrow lanes. Old-fashioned lanterns on the walls and business signs were reaching far into the alley, adding an irresistable charm to the streets. But then a signpost caught our attention, luring us to climb the spire of nearby St. Peter’s for a bird”s eye view of Lübeck. The nave of St. Peter’s in Lübeck looks rather strange. Barren and without pews, it is an open, white space which is still used for service on Saturday nights. Since we were visiting Lübeck with children and since children love to look on things from above we spontaneously decided for a tower tour of the church. Up we went in the rattling elevator to enjoy the views from the spire of St. Peter’s. Up there, the wind was fierce and icy but the air was clear and fresh, and we could easily make out the streets and the well-known sights of Lübeck. To be honest, the views were slightly disappointing as I had expected Lübeck to be one of the better preserved cities in Germany. Unfortunately, there were some gaps in the medieval core of the city which had since been filled with ugly modern buildings that looked like any other building in Germany. Nevertheless, some of the best attractions were still clearly visible and the views helped us forge a plan for the next part of our city tour. But before we left the church we risked a quick look inside the nave which turned out to be nothing like we had ever seen in a church. Barren, with no pews but large white sheets and whitewashed walls, it was today used for rather unconventional services on Saturday nights. 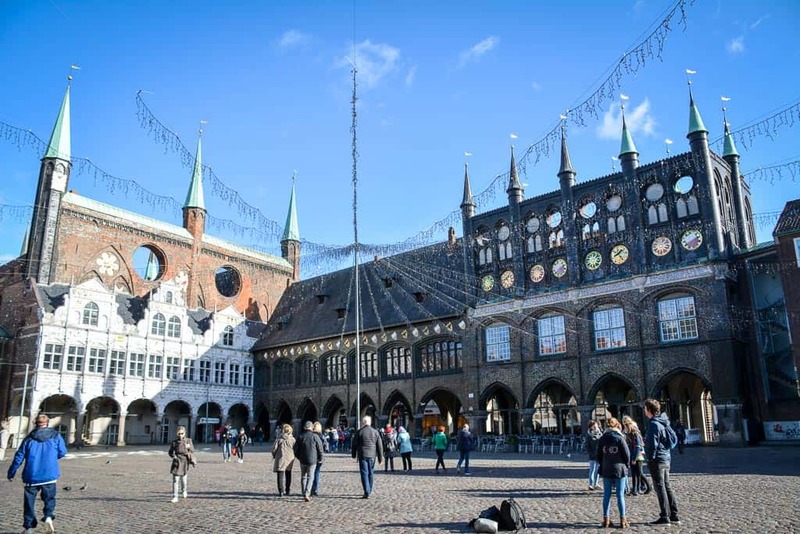 The market square with the town hall was the beating heart of Lübeck and the pride of the medieval city. From the top of the church we headed to the next destination of our Lübeck sightseeing tour, the medieval market square. With our backs turned to the unsightly P&C department store we had a fantastic view of the beautiful old buildings surrounding the square to two sides. The stars of the scene: St. Mary’s and the Gothic town hall with its arched windows and imposing brick facade. In one corner of the square we spotted the so-called Kaak, rebuilt only a couple of years ago but with origins dating back to the Middle Ages. Resembling an open stall with two levels it is used in winter to sell hot drinks to visitors of the Christmas market. Centuries ago, people would buy butter here, but at one stage it has also been used as a pillory and a courthouse. We walked through the town hall arcades to get to the other side of the town hall where we found some more remarkable features such as a beautifully painted enclosed balcony and the imposing entrance. The Buddenbrookhaus Museum was once the childhood home of world-renown novelists Thomas and Heinrich Mann. We were now on Breite Strasse which soon met with Mengstrasse, the place where Thomas Mann grew up and which incidentally was also the setting of his most famous novel “Buddenbrooks”. A fascinating way of mixing reality and fiction. Like a fan girl I stood in front of the house for a couple of minutes, studying the details of the white facade. Inside, there was today a museum dedicated to the novelist brothers Thomas and Heinrich Mann as well as a number of period furnished rooms. Since we were visiting with children we decided against a visit to this literary museum in favour of some more hands-on experiences. At its time, the Holy-Spirit-Hospital was a groundbreaking social institution which cared for the elderly and the sickly. Inside, the building is beautifully decorated. After a couple of minutes we reached the 13th-century Holy-Ghost-Hospital. The wealthy Lübeck merchants had founded this social institution to care for elderly and sickly citizens. Unfortunately, we visited on the wrong day and the hospital was closed to visitors for the set-up of a artisan market inside. However, we were able to at least see the beautifully adorned entrance hall with its colourful windows and painted saint statutes. Peeking through the gates we could also catch glimpses of the inside of the hospital where we could make out wooden enclosures for the patients and an elaborate medieval mural. A fascinating building with lots of flair and history which I would love to inspect further one day. The Burgkloster Monastery was part of the European Hanseatic Museum and offered some intriguing glimpses into the Middle Ages. After a delicious lunch at Taj Mahal Restaurant (Große Burgstraße 59, 23552 Lübeck) we visited the critically acclaimed European Hanseatic Museum. I was particularly interested in the attached Burgkloster monastery, even though the focus of the museum was the history of the city and the trading routes of Northern Europe. We didn’t plan to spend too much time at the museum, as always dragging with us moody and tired kids who would have rather spent the day at the holiday home playing computer games. So we kept it short and sweet and concentrated on the Burgkloster monastery almost exclusively. Despite its power and wealth during the Middle Ages, the monstery today had not so much going for it. Lots of whitewashed walls and empty rooms, just a handful of exciting artwork and artefacts from the glorious days when this was once one of the most influential monasteries in Germany. In the end, we also visited the courthouse, gaol and poorhouse, all purposes that the building had once served over the centuries. Füchtingshof has once been a home for widows of seafarers and traders. To this day, it is home to a handful of residents to keep the courtyards tidy and clean. The biggest treat of our day trip to Lübeck would be at the very end of our tour. The city is renown for its collection of medieval laneways and courtyards, many of which can be explored to this very day which we duly did. The laneways were footpaths that would provide access to housing deep inside the medieval housing block. To reach the laneways we would first of all have to find them. The kids led the way as we were on the lookout for faded signs over tunnel entrances in the facades of the houses. Behind closed gates we went, kids first, full of excitement, until we reached the houses in the back. These medieval houses were still lived in, well preserved and modernised, maintained by the residents. Cosy and intimate, a real treat that was unique to Lübeck. We found most of these laneways between the streets of Engelsgrube and Fischergrube. Our favourite one was called Bäckergang, literally baker’s laneway. So-called Stiftshöfe were the other attraction that were quite unique to the city. A social welfare instution set in place by wealthy citizens to provide poor people, widows and young women a home within the city walls. These courtyards would be off the main roads, surrounded by buildings, some of them of communal nature, with gardens and lawns inbetween. We explored Füchtingshof and Ilhornstift, both of them located in Glockengießerstrasse. The laneways of Lübeck would lead to hidden backyards and further housing deep inside the block. In most cases, visitors would first have to walk underneath the front house to reach the hidden part of the building complex. The Hanseatic city of Lübeck was indeed a pleasant surprise, even though at the beginning not in a positive way. I was expecting the old town to be more consistent and with less visual disruption by cars and post-war buildings. But then we looked deeper and started our sightseeing of places like the town hall and the Holy-Spirit-Hospital which were each of their own simply mind-blowing. But in the end it were the medieval laneways and the courtyards which really won me over as they were so special and so unique to the city. In particular in summer it must be wonderful to explore these little places which are lovingly maintained by the residents. 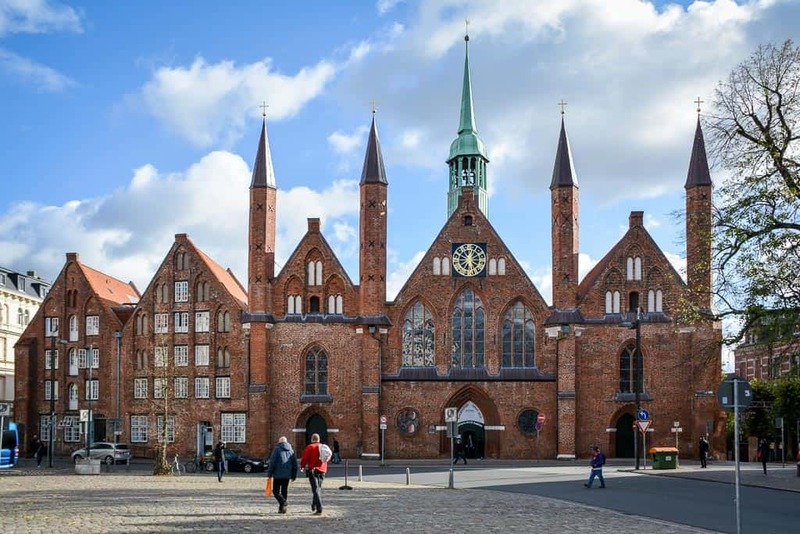 For further information on Lübeck have a look at the official website of the City of Lübeck which may not be very user-friendly but comes with lots of good and useful information.